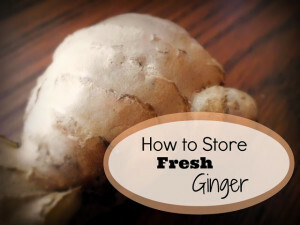 Nancy of Livin’ in the Green has a great tip on how to store fresh ginger so that it will last longer. Normally if you don’t peel ginger, it will stay fresh for 3 weeks in the refrigerator. However, Nancy has a method she uses that extends the life of the ginger. Click on the How to Store Fresh Ginger link below to see Nancy’s tip.